Pedestrian mall, College and Dubuque Streets. This photo features the fountain informally called "Three Women Peeing," an unnamed sculpture created by Bob Satter and Brian Gutheinz. It was a tubular fountain on stepped brick platform, made with steel (? ), brick and concrete. According to a July 23, 1992, article in the Daily Iowan, the fountain cost $80,000 to build and donations were collected by Project Green. 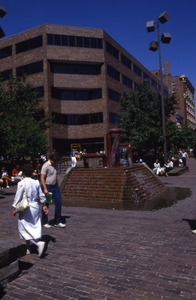 The fountain was built in 1978 and dismantled around 1999-2000. 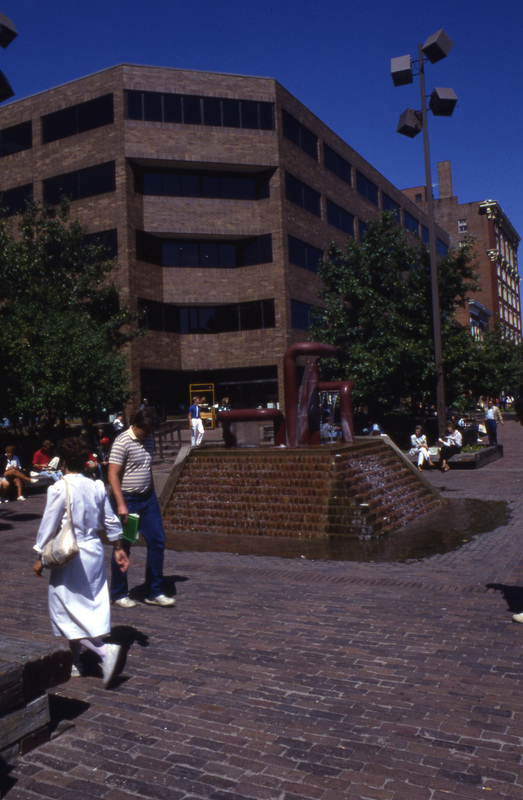 “Plaza Centre One and Fountain, 1980s,” Iowa City Public Library, accessed April 26, 2019, http://history.icpl.org/items/show/723.